Spiegler is hands down the best brake line manufacturer around. 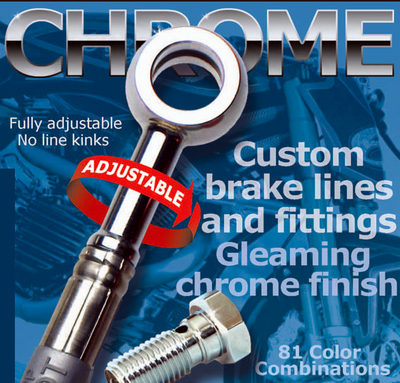 We have built a great relationship with Spiegler over the years while building many custom bikes and are happy to offer you the best of the best in brake lines for less. We don’t eliminate manufactures names in hopes someone will think these lines are ours. We dont mount brake lines with paperclips either. Nope, we are damn proud to tell you they are Spieglers and Spiegler is our friend. We can offer you these lines in a stock configuration or also we offer them in custom lengths. Just tell us what you want and we’ll make it happen for you same as we have many others. We use these on our own bikes also and wouldnt use anything else. Spiegler’s patented stainless steel braided brake lines eliminate expansion under the most severe applications. Even under extreme pressure the lever feel remains consistent. DOT and TUV approved for street use. Patented torsion system eliminates line twist. Kits are available ready to install, or as individual lines for custom applications. A generally unrecognized manufacturer’s recommendation is that all original rubber hydraulic hoses should be changed every four years to avoid failure. Spiegler brake lines are maintenance free and will provide reliable service for the life of your motorcycle. 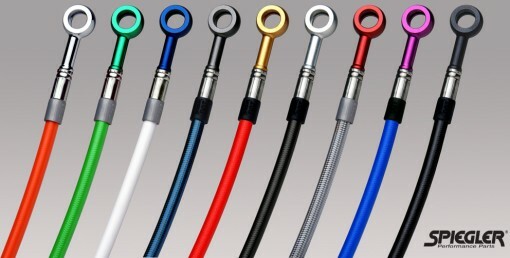 Steel braided brake lines are available with black, red, blue, carbo / smoke or translucent blue vinyl covering. 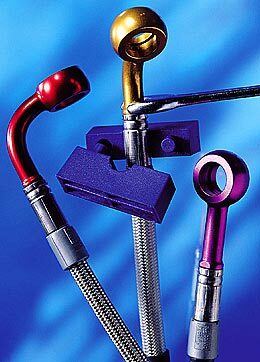 Fittings are available in green, silver, gold, chrome, blue, black, purple, red or titanium. Colors of line material and fittings can vary due to different lighting during photography. Replace your old rubber OEM brake lines with Spiegler braided stainless lines. Enjoy the security of a lifetime warranty with Spiegler braided SS brake lines. Call or Email us and we will help you get the right fit and color combo of your choice for your Honda Fury.